Recently, Walmart an international e-commerce giant has struck a deal to acquire Flipkart Pvt Ltd, an Indian e-commerce company based in Bengaluru. The acquisition has become one of the major topics of Group Discussion (GD) round in B-schools. To help the participants in GD round, MBAUniverse.com has prepared and shares the key facts about the acquisition, pros and cons on how the deal will impact Indian economy and key tips how to improve your chances in GD round. Walmart, the largest e-commerce giant acquired a controlling stake of 77% in Flipkart ( India’s largest e-commerce company by market share) by investing $16 Billion. The deal will help Flipkart leverage Walmart’s omni-channel retail expertise and general supply chain knowledge. Walmart aims to extend their B2B sales across India through this acquisition. Walmart has a strong global physical presence in retail space but lacks in e-commerce. This deal can spur their online presence in Indian markets. 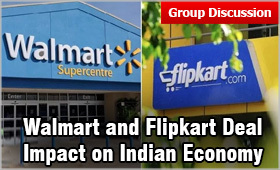 Both Flipkart and Walmart shall maintain separate brands and operating structures. Why did Walmart acquire Flipkart? As per Morgan Stanley, India’s online retail is set to grow by 1,200% to $200 billion ( 30% CAGR) by 2026 from $15 billion in 2016. Average wages are rising by 2% annually and internet penetration is also growing as data costs are becoming more competitive. This makes Indian e-commerce space lucrative. Flipkart has the largest market share in e-commerce, so with this acquisition Walmart can achieve next leg of growth in India with Flipkart’s 175 million registered user base. Low prices, more variety: With the e-commerce giants competing for the top spot, product differentiation and localization will bring more variety and create a diverse product basket at low prices, this shall benefit the Indian consumers. R&D: For greater market penetration across the country, efficiency is the key which comes with more R&D. Walmart is known for its culture of innovation and service. This can help in scaling up Walmart’s business scale in India which can generate more revenue and create technological spillovers and learning effect for domestic firms as well. The improved sophisticated nature of the products will create external demand for Indian goods. Collateral Benefits: As the world’s largest retail giant pours funds, it will lead to more such investments in e-commerce. The Indian e-commerce market space was drying up as funding ebbed following liquidity issues due to Demonetization and GST bottlenecks. Walmart’s entry will usher fresh funds and rejuvenate e-commerce ecosystem as more foreign firms and venture capitalists enter India . With e-commerce giants revamping their business models, Indian e-commerce market is expected to see broad based growth with better productivity. Efficient Supply Chain: Expansion of e-commerce requires efficient supply chain and logistics which require infrastructural development. This will give a fillip to Indian agriculture and infrastructure and benefit farmers as they would be able to cater to more demand as Walmart shares its extensive experience in retailing, logistics and inventory and supply chain management. This can especially help the perishable goods industry which is Walmart’s forte. JOB CREATION: With more investment flowing in Indian economy especially in retail space, capacity utilization shall improve . Output and productivity growth can create new employment opportunities for both skilled and unskilled labor . ESOPS( Employee stock options): Many existing employees will make windfall gains through this deal from their stock options. This will incentivize the entry of more workers in e-commerce who had earlier fled the sector due to the downturn in the sector and can also absorb workers from old brick-and-mortar and traditional industries which can help in formalization of more of Indian labor force. PREMJI INVEST is expected to gain up to 4 times from this deal as its share in Myntra (bought by Flipkart in 2014) is also being acquired by Walmart. The gains are expected to be more than $130 million on the $25 million investment. This will lead to inflow of more funds pouring in Indian economy as gains attract more investors from India and abroad. Mom and Pop stores: Walmart is looking to extend its supply chain arm through partnerships with around 60 lakhs kiranas. This can increase the market presence of small stores. Brick and Mortar Stores may shut down: Walmart is known for scrapping small businesses which are selling at ultra low prices through Flipkart. Walmart may bring in its own labels with hyper-competitive prices and replace the domestic MSMEs which can be a threat to brick and mortar stores as they fear shut down due to competitive pressures. Small Players (Mom and Pop stores) will be hurt by this as market spaces shrink due to cut throat competition which force small firms to exit. In an attempt to survive in the market, firms practice excessive price cutting at the cost of viability and profitability which leads to inefficiency. Threat of Pan India Protests:Tamil Nadu Vanigar Sangankalin Peramaippu federation of traders has already warned the government of pan India protests. Many more trade unions may call for such protests which can hurt our economy, create social chaos and cause infrastructural damages. Backdoor entry for Walmart: FDI in India allows 100% FDI in single brand retail. Walmart is a multi brand retail chain where 100% FDI is not allowed, so it focused only on cash and carry business. Flipkart has already circumvented such restrictions in direct selling which will be used by Walmart. Big Data Mining: Large data of Indian shoppers will be shared with the US retail giant which may give large controls to a foreign firm can use it to control our domestic value chain in consumer goods space and buying patterns. Real time data analysis can help in identifying the consumers & their needs better than domestic players. Therefore, there is a need to keep a system of checks and balances to avoid any instance of data breach of Indian customers. Use the quote and data; if you are sure of the source else leave it. You may encounter volley of questions on the economic statistics, trade data or historical facts from your fellow participants. Unless very sure, don’t use it.